The word "amulet" comes from the Latin (amuletum), an indication of the power Romans invested in amulets as protection against evil spells. Prehistoric amulets representing fertility and animals have been found near some of the oldest known human remains. Archaeologists have also unearthed shells, claws, teeth, and crystalline solids dating to 25,000 B.C.E. ; engraved with symbols and sporting small holes, the objects were probably worn as necklaces. Animals have been used as symbols in amulets since the earliest times. Modern amulets include a rabbit's foot; when rubbed it is activated to bring luck. The wishbone from the breast of a bird is believed to make wishes come true to the person lucky enough to hold the larger half when the bone is broken with a partner, a common practice at Thanksgiving Day dinners in the United States. Metal representations of wishbones and rabbit's feet have become popular amulets in contemporary times. By the time the Roman Empire was established in the first centuries B.C.E., however, amulets had a long history of being worn for luck and protection. Egyptians considered amulets necessary for protection of the living and the dead. An amulet with a heart on it was often placed with the dead to help represent them in judgment about their fate in the afterlife. Likenesses of scarabs (a kind of beetle) were also prominent. A scarab encloses an egg in mud or dung and rolls it along to a spot where it can be warm and safe. Egyptians considered this a metaphor for the journey of the sun each day. The scarab amulet became a common emblem for regeneration and was placed with the dead. Sumerians, who inhabited Mesopotamia (present-day Iraq) and were contemporaries of the Egyptians, had amulets inscribed with images of animals and gods. They also inscribed such images on seals for everything from pottery to vaults to doors: the emblem on the seal represented a guardian spirit that would bring bad luck to those who opened the sealed compartment without permission of the owner. The treasures of King Tutankhamen of Egypt (c. 1370–1352 B.C.E.) abound with crystals in the form of gems and jewels. They were intended for personal adornment, but they also had symbolic meaning: they were believed to possess mystical and religious powers. Today, crystals are still worn for decorative purposes in the form of gems and jewels; those who believe in the mystical powers of crystals wear them as amulets. 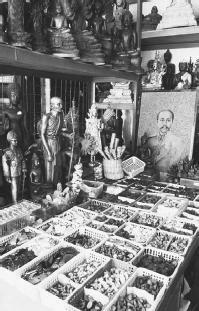 bring good luck and to ward off evil. A favorite contemporary Muslim amulet consists of a square-inch miniature of the Koran enclosed in metal and worn around the neck. Muslims also believe they gain power by wearing amulets inscribed with a form of the name of Allah. Amulets are frequently mentioned in Talmudic literature where they are called kemiya and often consist of a written parchment or root of herbs worn on a small chain, a ring, or a tube. Many such amulets had healing purposes: they were considered legitimate only after having worked successfully in healing on three different occasions. Another kind of parchment amulet was the mezuzah, a Hebrew word for door post. Moses (14th–13th century B.C.E.) commanded Israelites to inscribe the words "Hear O Israel, the Lord Our God Is One God" on the doorposts of their homes. An amulet with those words continues to be attached to doors in many modern Jewish households, or worn as a gold chain around the neck for good luck. Early Christians inscribed the word ichthys (Greek for "fish") on their amulets because the word contained in Greek the initials for Jesus Christ, Son of God, Savior. The fish symbol has been important to Christians ever since. A simple cord is perhaps the plainest amulet of them all. Wrist, ankle, and neck cords are popular in contemporary times and have a long history. Unlike other amulets, which when lost or broken are believed to end luck or protection, cords release magic to come true when they break naturally from wear. An amulet lost or broken might be a reason for despair, but a broken cord should signal the beginning of good fortune. Pavitt, William Thomas. The Book of Talismans, Amulets, and Zodiacal Gems. New York: Samuel Weiser, 1970. Gaskell, G. A. Dictionary of All Scriptures and Myths. Avenel, N.J.: Gramercy Books, 1981. Walker, Barbara G. The Woman's Dictionary of Symbols and Sacred Objects. Edison, N.J.: Castle Books, 1988. Kunz, George Frederick. The Mystical Lore of Precious Stones. San Bernardino, Calif.: Borgo Press, 1986. Buckland, Raymond. Advanced Candle Magic: More Spells and Rituals for Every Purpose. St. Paul, Minn.: Llewellyn, 1999.
Cooper, Phillip. Candle Magic: A Coveted Collection of Spells, Rituals & Magical Paradigms. New York: Weiser, 2000. Riva, Anna. Candle Burning Magic. Toluca Lake, Calif.: International Imports, 1995. Telesco, Patricia. Exploring Candle Magick: Candle Spells, Charms, Rituals & Divinations. Franklin Lakes, N.J.: Career Press, 2001. Hope-Simpson, Jacynth, ed. Covens & Cauldrons: A Book of Witches. London: Beaver Books, 1977. Conway, D. J. Crystal Enchantments. Santa Cruz, Calif.: Crossing Press, 2000. Cunningham, Scott. Cunningham's Encyclopedia of Crystal, Gem & Metal Magic. St. Paul, Minn.: Llewellyn Publications, 1987. Jones, Wendy. Magic of Crystals. West Sunbury, Pa.: Harper House Books, 1996. Simpson, Liz. Book of Crystal Healing. New York: Sterling Publications, 1997. Bord, Janet. Fairies: Real Encounters with Little People. New York: Dell Publishing, 1998. DuBois, Pierre. The Great Encyclopedia of Fairies. New York: Simon & Schuster, 2000. Keightley, Thomas. The World Guide to Gnomes, Fairies, Elves, and Other Little People. New York: Random House, 2000. Rose, Carol. Spirits, Fairies, Leprechauns, and Goblins: An Encyclopedia. New York: W. W. Norton & Co., 1998. Spence, Lewis. The Fairy Tradition in Britain. London: Rider and Co., 1948. Allison, Lynn. The Magic of Garlic. Boca Raton, Fla.: Cool Hand Communications, 1993. Opie, Iona, and Moira Tatem. A Dictionary of Superstitions. New York: Barnes & Noble, 1999. Steiger, Brad, ed. The Occult World of John Pendragon. New York: Ace Books, 1968. Gaskell, G. A. Dictionary of All Scriptures and Myths. New York: Gramercy Books, 1981. "The Mandragora Plant—Myths and other Information." [Online] http://www.wordfocus.com/anesthes-wrd-hist.html#mandragora. November 11, 2002. Eichler, Lillian. The Customs of Mankind. Garden City, N.Y.: Doubleday, 1937. Central Australian aborigines believed that the ratapa, spirits of unborn children of their tribe, lived in trees, rocks, and sprigs of mistletoe. The Japanese chopped mistletoe, leaves, and millet, and offered prayers for a good harvest. Swedes hung a mistletoe besom (broom) in the house as a charm against lightning. Swedes used mistletoe rods to locate treasure in the earth. The rod was supposed to quiver, like a divining rod, when it was over the treasure. Austrians hung mistletoe over the doorstep to protect people in the house from nightmares. 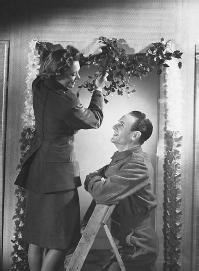 Since ancient times, a kiss under the mistletoe was a pledge of love and a promise of marriage. The kiss of friendship was given under a mistletoe to signify a truce. Enemies who met under the mistletoe in the forest were to lay down their arms, exchange friendly greetings, and keep a truce until the following day. "Mistletoe." [Online] http://www.celticattic.com/olde_world/myths/mistleoe.htm. November 11, 2002. Cirlot, J. E. A Dictionary of Symbols. Translated by Jack Sage. New York: Barnes & Noble, 1993. Gifford, Jane. The Wisdom of Trees: Mystery, Magic and Medicine. New York: Sterling Publications, 2000. Paterson, Jacqueline Memory. Tree Wisdom. Great Britain: Thorson Publishing, 1997.